"The Fera Stealth parka and pant provided for Scotty worked wonderfully. 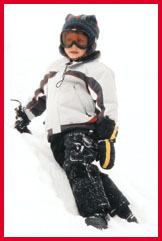 The functionality of the ski and snow suit was outstanding. The fabric was warm, and repelled snow and water keeping Scotty comfortable in all conditions. The fit was perfect for this four-year-old and was easy to get in and out of." "The jacket was perfect. It was stylish and had a million pockets for stashing treasures. It had a nice hood that was available when needed but hid away nicely when not needed. The fashion suited Scotty well and made him look sharp on the slopes of trendy Deer Valley. A red stripe under the arms provided a welcome highlight that caught other skier's eyes and provided an unintended safety feature." "The flat black pants matched well with the lighter jacket and provided comfort in all snow activities. 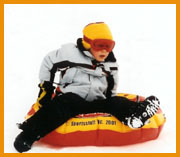 The pants are held up with a waistband rather than snow bibs providing an access point for snow to slip inside. But, for non-bibbed pants, these are probably the best we've encountered. There were only a few yelps of icy distress all season. These yelps, however, were less frequent than the number of race runs to the potty, where the lack of cumbersome bib-overalls was greatly welcomed. The pant's boot cuffs could use some improvement. The lack of a zipper made grabbing the inner cuff difficult." "Fera's product durability appears to be outstanding. After a whole season of rubbing against salt laden cars and sliding into muddy slush puddles, the suit washed up beautifully and looks as good as new. This suit could definitely weather multiple seasons of abuse." Or visit Fera's website at ifera.com .